Discover the So Smooth and Moroccan Argan Oil ranges and be your own professional stylist, without paying salon prices. Bringing you the latest hair advice, top competitions and information on our fantastic products, Salon Chic makes it easy to enjoy your hair at its best. Prized by celebrities and top salons, Moroccan Argan Oil nourishes hair from root to tip leaving it glossy, thick and beautifully conditioned. 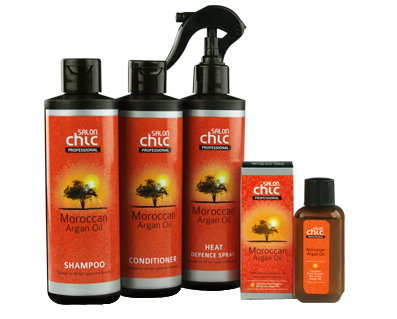 The new Salon Chic Moroccan Argan Oil range of shampoo, conditioner, heat defence spray and organic finishing oil brings you this highly sought after natural ingredient at an affordable price. Blended with Vitamin B and UV filters, this exclusive range protects hair against the elements and boosts shine and vitality. Banish frizz forever with the Salon Chic So Smooth range. The straightening balm, straightening mist and shine serum are formulated to protect against heat damage and smooth each hair cuticle. Containing Vitamin E and UV filters, choose this range to shield hair against the stresses caused by styling, sunlight and free radicals. Buy Salon Chic online here!